In July, I received a total of 104 (!) items, though I know from my Postcrossing stats report that 23 of those were Postcrossing postcards. 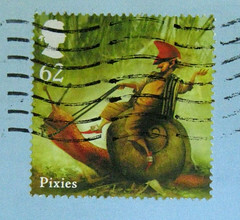 I also know from my Postcrossing stats report that 23 of my sent items were Postcrossing postcards, so those sort of cancel each other out, I suppose. Anyway, I was clearly behind on staying ahead of the in/out mail curve. I guess this would be a good time for me to say that I am just spreading myself too thin, mail-wise. Things are about to get very busy for me again in other aspects of my life, and I have not been doing right by my long-term pen pals. So I hate to say it, but I really have to: I can't take on any new pen pals now. If you want to write to me, then by all means do so, but I can no longer say I shall respond to every letter I receive. Please use my "How to find people who might write you back" section (left-hand sidebar, under the old U.S. Mail logo photo) if you're looking for more pen pals. I still love blog reader letters, I probably always will, but something's gotta give at some point. I'm not even going to COUNT my needs-response pile right now, but it's got 4 large piles (waaaayyyy too big for one single pile now) of letters and postcards dating back to February. In one sense, I'm so-o-o envious of your pile of mail waiting to be answered. In another sense, though, I'd be totally overwhelmed! I agree with the previous poster on both accounts. Your July stats are still better than mine..My stats have gone down steadily since I started keeping track. But some of that was the hospital stay and now the move NUGH so I hope that after we move I will be back to full output mode. I understand why the mail pile is daunting and you can't take on new penpals! Will you still be answering mail from people with whom you were already corresponding (such as me)? Ha! I like Felicity's idea. (Well, not really.) Your experience really does warn me not to bite off more than I can chew - though I'm still making sure to stay on top of correspondence and make more pen pals at a moderate pace.